These are true bilberries not blueberries as some people use – smaller, sharper tasting – a real North Country favourite. 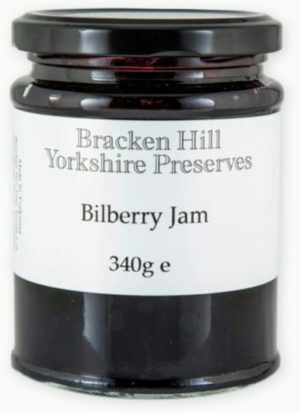 I was so pleased when I came across Bracken Hill’s stand at the Harrogate Flower Show a couple of years ago and realised they sold Bilberry Jam. It certainly made my father’s day when I bought him several jars for his Christmas present a year ago. I’m getting him some more for his birthday. Its such good value for an excellent jam. I am not sure when I first had bilberry jam but it has taken DECADES to find a good quality product again. Bracken Hill Bilberry jam is amazing – MASSES more flavour than blueberry efforts that others sometimes pass off as bilberry. Almost time to buy another 4 pots I think – probably a good job there is no discount for larger orders or I would be sorely tempted! Pure excellence! been looking for bilberry jam this for a while. I tried for months to track down some bilberry jam, good value and an excellent product. Sugar, Bilberries 40%, Lemon Juice (From Concentrate), Gelling Agent: Fruit Pectin, Citric Acid, (Prepared with 45g Fruit per 100g. Total sugar content 66g per 100g).